I bought this for my daughter, she loves it. It is very easy to get books for the Libre, but I would suggest to directly load it onto the memory card since the included software is a little limited in its application. It does not recognize all the books that were downloaded and does not tranfer them to the Libre. For the price it is a very good deal. I bought this for my fourteen year old daughter's birthday and the first one I got crashed when I plugged it into my computer so I had to returrn it and get a new one sent to me, the new one worked great and I did a web search for sites that offered free e-booka and found a ton of them out there! So her new reader will be free for her to use for a while!! It also came with a link to Borders so we can also get e-books from them!!! Very cool!! I also liked the MP3 player on it and loaded up some music for her to use as background when she reads!! I bought this for my 11 yr old for her birthday. It has survived her so far and she has discovered many of the classics that cam with it. The screen is easy to read. It handles TXT and ePubs just fine. PDFs are okay, but you cannot change the size of the font. I found this to be a very handy gadget to take wherever you go. Car trips, vacations, waiting in Dr. office, etc. Having the MP3 player in the unit is a great feature also. The battery lasts a long time (but takes a while to fully charge). 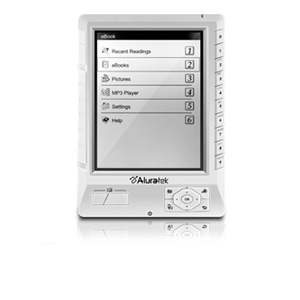 In my opinion, the Aluratek e-book reader is one of the better ones on the market. Great product, great price. Highly recommend for personal use or as a gift.